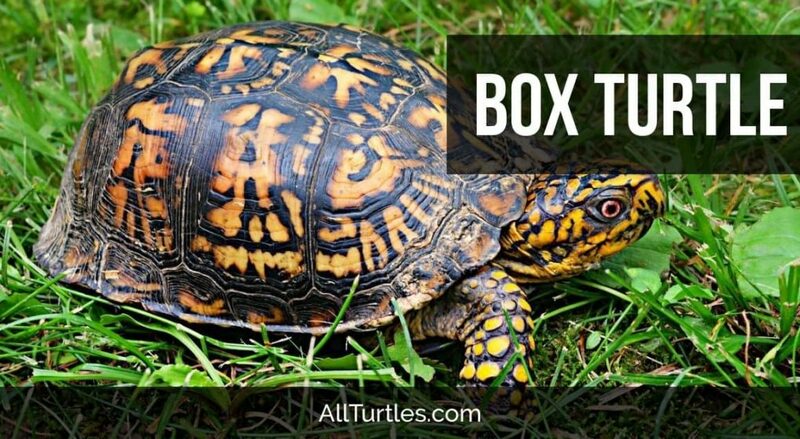 The box turtle is a species like no other. With a beautifully powerful shell and gentle demeanor, it’s popular among pet owners and wildlife enthusiasts alike. This timid creature is native to both the United States and Mexico, though there is an Asian species of box turtles living in the Eastern region of the globe. Box turtles are easy-going reptiles whose needs in captivity are highly complex, though this does not stop animal lovers from making them common pets. Because most wild turtles live in climates that have a wide range of temperatures, they need to hibernate three to five months out of the year in order to stay alive. During these cold temperature spells, food is not as plentiful and the weather does not permit normal bodily functioning. It is during this time turtles tuck themselves tightly into their uniquely hatched shells and stay sheltered until spring. While some may assume this is a safe period, it is actually quite dangerous. These turtles must retain minimal bodily functions: digestion stops, heart rate slows, and eye movement ceases. This period is common for turtle deaths. Owners of these special creatures need to understand key box turtle facts. During winter, the box turtle habitat tends to be well-protected and south-facing. Examples of suitable locations include hillsides, tree roots, grassy knolls, and mossy boulders. It is important to be able to snugly hide from predators during this fragile period. When keeping this turtle in captivity, it is unlikely an average backyard will be an adequate hibernation solution. These reptiles need the right kind of environment to remain healthy and maintain reproduction cycles. If you do choose to allow your pet turtle to hibernate outside, it is important to be aware of your city’s climate to make sure temperatures do not get too cold. Make sure the dirt is soft enough to dig into deeply, as many wild turtles have been found up to two feet below ground during hibernation. Should you choose to allow your turtle to hibernate indoors, you can use any cool, tightly enclosed place with soft hay or straw at the bottom. To ensure turtles are getting enough oxygen, make sure holes or slivers exist in the box to allow for fresh air to come through. Pet owners need to assess the health of their turtles before subjecting them to hibernation. Many turtles are too young or sickly to survive in the winter. In these instances, keep turtles in their warm habitats throughout winter and do not allow them to hibernate. Check on your turtle often during this period and look for signs of sickness or distress. Should your turtle hibernate too long, gently bring up the temperature of the habitat over the course of several days or else the animal may suffer from weakness. Turtles just coming out of hibernation should be given plenty of access to food, water, and sunlight. These special turtles eat a wide range of foods. Wild turtles eat almost anything they can catch, but mostly consume vegetation and small insects. When in captivity, box turtles eat mostly vegetation and fruit supplemented with worms and other invertebrates. Scientists estimate these omnivores consume half vegetation and half animal foods. Should your pet turtle be hesitant to eat the food you provide, try dousing the morsel in water before you offer it. Healthy turtles can eat a balanced diet of carrots, dandelions, earthworms, mushrooms, and berries. Experts, however, suggest never feeding these animals the same food two meals in a row. Turtles can become too selective with what they eat should the same meal be offered too often. All reptiles need light to thrive, and turtles are no exception. Make sure your pet either receives plentiful direct sunlight or has an acceptable alternative for optimal box turtle care. Certain brands of light bulbs are specifically made to emit UV-B rays. These lights can substitute for the sun’s rays for a box turtle habitat in certain cloudy or cold climates. For the best box turtle care, provide access to adequate light at least 12 hours a day. Turtles that have minimal light can become sick and underfed. For the best box turtle habitat possible, choose wide, open environments with plenty of available shade and moisture. It may be necessary to keep the enclosure humid by spraying water on the turtle’s back or directly onto the dirt where the animal regularly crawls. All turtles need a highly humid environment in order to thrive. Keep stones or pebbles in one area of the turtle’s environment to help keep toenails short and polished. Some box turtle facts with regard to habitat include their enjoyment of swimming in shallow waters and their need for security when resting. Turtles need a tightly compact place to burrow in order to feel safe from predators. Whether purchased or found naturally, the following make suitable substrates: hollow logs, small caves, soft dirt, loose roots, or straw. When turtles are provided a small pond or pool of warm water, they use this area to regulate temperature and defecate. This area should be cleaned and maintained daily in order to keep the environment clean. Water should never be too deep or your pet could drown; provide an easily accessible exit so your turtle can wade to safety. In addition to depth, pay attention to temperature, as frigid water can disable a turtle and cause irreversible harm. These special creatures average six to eight inches in length, with some in Florida spanning to almost 12 inches. Males will have longer tails than females. They weigh between 350 and 450 grams, though many turtles lose up to 25% of their weight during hibernation periods. Most turtles die in infancy when their shells are weakest and most vulnerable. However, a box turtle who survives past its most fragile age can live from 30 to 50 years. Since these reptiles have a highly domed, hatched shell, once fully hardened, these shells can protect a turtle from almost any predator. Box turtle facts with regards to egg-laying include the female’s ability to retain male sperm for up to four years. This allows the female to lay enough eggs during fertilization. Sadly, only a small percentage of these eggs will survive to hatch. 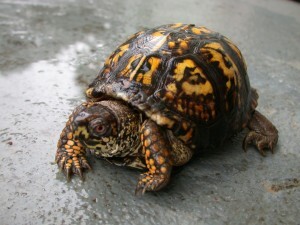 There are several different types of box turtle, including the T.carolina, T.c.ornata, and T.c.luteola. The T.carolina species has a prominent keel absent in all other species. While the T.c.ornata has a smaller striped shell, it is somewhat denser than the larger, more ornately patterned T.c.luteola shell. The males also have a concave area on the lower part of the shell, while this is absent in the female. What Next? Check out some other stuff on All Turtles!